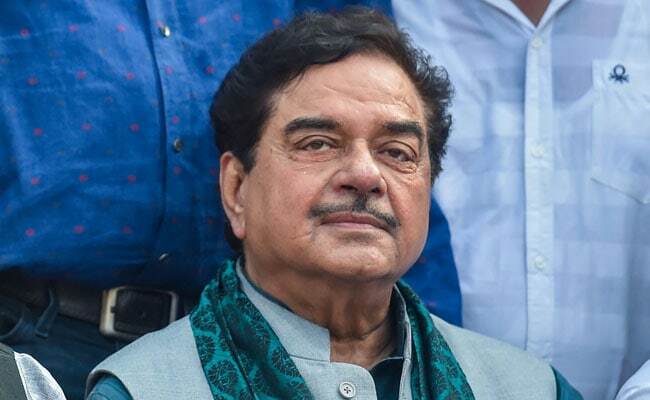 BJP parliamentarian Shatrughan Sinha will attend Trinamool chief Mamata Banerjee's rally for anti-BJP parties on Saturday in Kolkata. However, the leader -- who has not skipped any opportunity to attack Prime Minister Narendra Modi in the past-- says his loyalty for his party cannot be questioned. "I joined BJP when it was a party of two MPs (Members of Parliament) and I have always worked to strengthen it," he reasoned. Mr Sinha says he will attend the rally as a representative of the party launched by his associate Yashwant Sinha, another BJP dissident. "Even some BJP leaders participate in the programme of the RSS (BJP's ideological mentor)," he told PTI. Ms Banerjee had been at the forefront of talks for the alliance between the Congress and major regional parties. Complications, however, developed in the opposition's idea of a united front against the ruling BJP, after the Congress won the elections in three Hindi heartland states. At a meeting, DMK's MK Stalin's proposal to make Congress chief Rahul Gandhi the prime ministerial face of the block was vociferously shot down by the opposition parties. TRS chief K Chandrashekar Rao also wants Ms Banerjee to join his version of the federal alliance that has no place for the Congress. When asked if Mamata Banerjee could become prime minister after the Lok Sabha election, Mr Sinha told PTI, "PM will be decided by people and leaders of the parties based on numbers after the election... But she is certainly in the category of best personality." He also called her a national leader. "She is no more only a regional leader but a prominent national leader," he said. The Lok Sabha member from Patna Sahib constituency will be a "star speaker" at the rally, the news agency reported. Those expected to attend the rally include former prime minister HD Devegowda and his son HD Kumaraswamy; Delhi Chief Minister Arvind Kejriwal, Samajwadi Party leader Akhilesh Yadav, Andhra Pradesh Chief Minister Chandrababu Naidu, National Conference chief Farooq Abdullah, Sharad Pawar and Lalu Yadav's son Tejashwi Yadav. Shatrughan Sinha was a union minister in the Atal Bihari Vajpayee government. He had contested and won the Lok Sabha polls on a BJP ticket from Patna Sahib in 2014, but grew apart from the top leadership after being ignored for a ministerial berth. Over the years, he has been attacking PM Modi. His most recent dig at the party was when he came out in favour of setting up a Joint Parliamentary Committee to look into alleged financial irregularities in the Rafale deal, a vehement demand made by the opposition parties led by the Congress.